Samhain (pronounced Sow-en), known to many as Halloween, is set between Autumn Equinox and Winter Solstice on the Pagan Wheel of the Year. The name Samhain is believed to be Gaelic in origin and harkened the end of summer…a time when the cows (sows) were brought in from the pastures, hence “Sow In”. This Holy Day beckons us to accept the death of the year, and leads us into the Winter months where we are directed to look within for guidance on how our next year should flow. The veil between the worlds is also at its thinnest at this time of year and our ancestors have the ability to join with us and honor the passing of our lives. They can be called in to help with the growing pains which occur when we decide to grow and shed that which no longer serves us. NOTE: It is very important to INVITE in the ancestors and not demand their presence, just in case they have chosen to incarnate again. It is time to let go…the year has passed. This ritual is broken up into three distinct parts. In the first part, Invoking the Ancestors, you will be making Spirit Vessels. Spirit Vessels are bottles used to attract and house the spirits of deceased loved ones (human or animal). They are created for multiple reasons: to bear witness to the rest of the Death-of-Autumn ritual, to call upon when you need help, and to protect you and your household in the following years. The second part of the ritual, the Funeral of the Self, will be the most intense part of your work and is the MAIN rite for this Cycle. During it you will be asked to journey, on your own, to your Mythic Landscape to determine what part of your SELF needs to be released this year. It is only when we make room, that our new SELF can appear; it is through this ritual that we make that space. You will then literally be conducting a funeral, where you lay that part of yourself to ground. The third and final part is Divination! 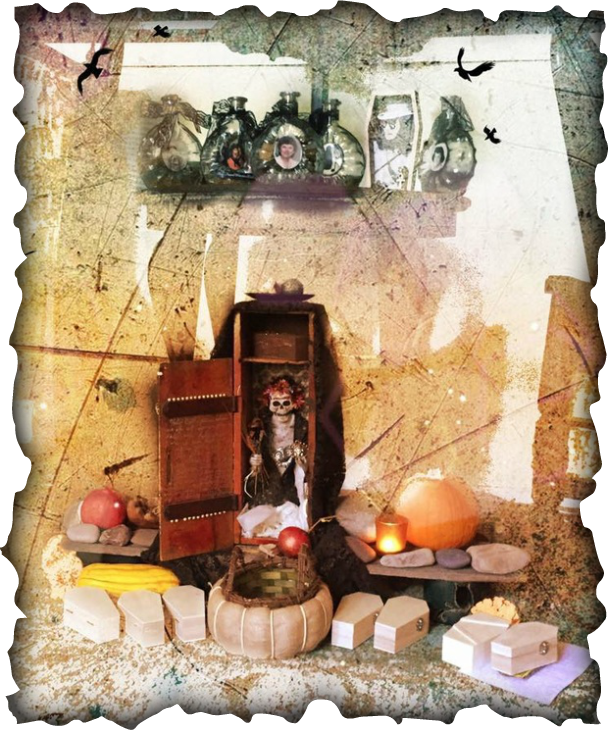 With your unhealthy parts successfully buried, you will ask your ancestors and any helping spirits to show you what the Death-of-Autumn Cycle has in store for you, as you make your way to the dark time. The ritual will conclude in the Activation of your NORTH-WEST Stone.